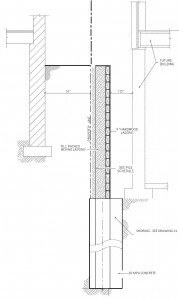 In this blog post we’ll be revisiting the build site at Allen Avenue to provide some information about residential construction shoring! Before we could excavate this site fully, shoring had to be installed at one side of the property to protect the neighbouring home. In this particular situation an addition was built on our neighbour’s property. The addition didn’t have a full basement though, so the footings had to be much higher than the footings of the Allen homes. 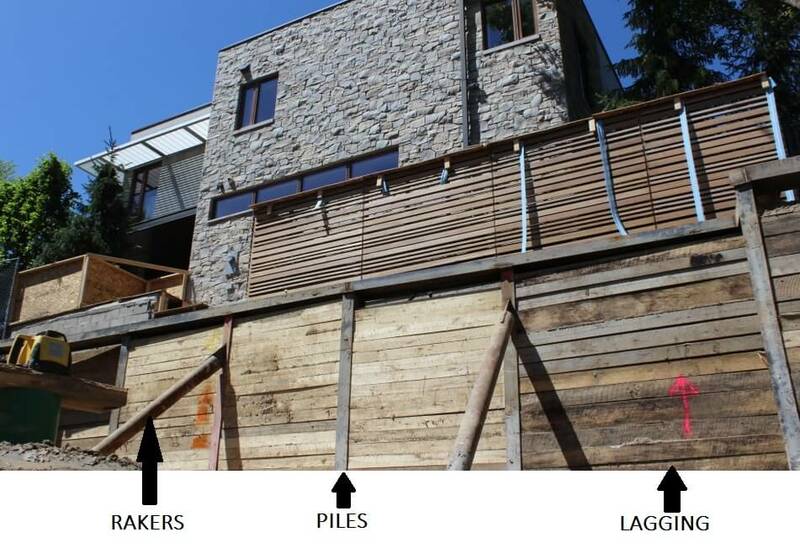 In order to protect the neighbour’s house from collapse and to hold the earth back in this section, shoring was required. Shoring is the process of managing heavy objects using props, beams or posts to support a wall. A shoring system functions to retain earth, water and adjacent structures during the build process. 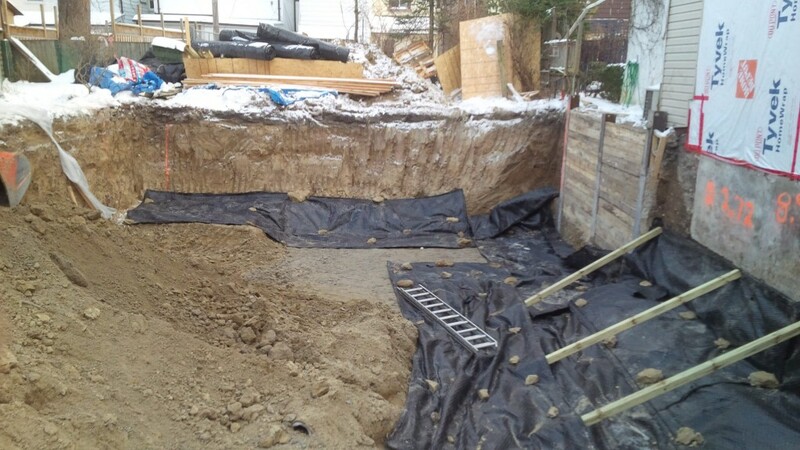 Shoring protects neighbouring properties, keeping them intact and undisturbed during the construction process. Shoring is used to protect the lives of the workers if the excavation can’t be sloped properly and there is a risk of dirt falling on top of workers in the excavated site. That being said, shoring is not for the faint of heart. It’s an expensive proposition that requires careful planning and execution. Shoring can cost thousands of dollars and, if not done properly, may cause significant damage to property, serious injury or death. There are a few ways shoring of dirt and structures. Your options, of course, depend on site conditions. Every situation has its own unknowns: soil conditions, loads from structure to be held back, ground water conditions — there are always many variables. A professional engineer is required to design the appropriate earth retention and support system for the specific application. When designing and building a shoring system, the appropriate professionals in your area should always be consulted. In most jurisdictions, hiring a geotechnical engineer and structural engineer are mandatory. The area in front of the lagging is then filled with gravel or dirt and a drainage mat is installed against it. If you know that shoring will be required be sure to plan for it in your budget. 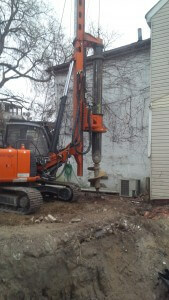 Costs may vary, but in our experience in the Greater Toronto Area, shoring will cost around $4,000 per pile. Piles are installed every 6-10 feet. Account for it taking approximately three days to install five piles with the associated lagging. Be sure to watch any adjacent structures for potential movement during the shoring process. Take lots of pictures before, after and during the operation — having a record will allow you to compare whether the structure has moved, or to prove that no movement occurred at all.